Samsung’s next phone is here. 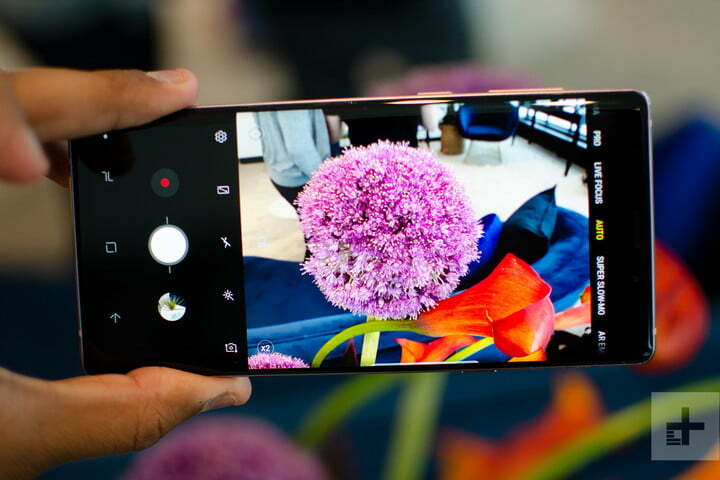 The Galaxy Note 9 packs a bigger screen than ever before, along with the usual upgrades in power, style, and camera technology. From the latest DeX news to all of the S Pen’s new features, here’s everything you need to know about the Samsung Galaxy Note 9. You can check out our Galaxy Note 9 review for our impressions of the phone, and our in-depth buying guide tells you where you can nab one. The water carbon cooling system in the Samsung Galaxy Note 9 is perhaps one of its most unique features, but not much was known about the feature — until now. Samsung has published a blog post offering a little more information about the water carbon cooling and how it works. Samsung notes that the cooling system in particular is built to prevent thermal throttling — which can result in sluggish performance. The system was actually built on the Samsung Galaxy S7’s water-cooling system, but Samsung has added a few features — like a layer of copper to transfer more heat — to make the system a little more efficient. 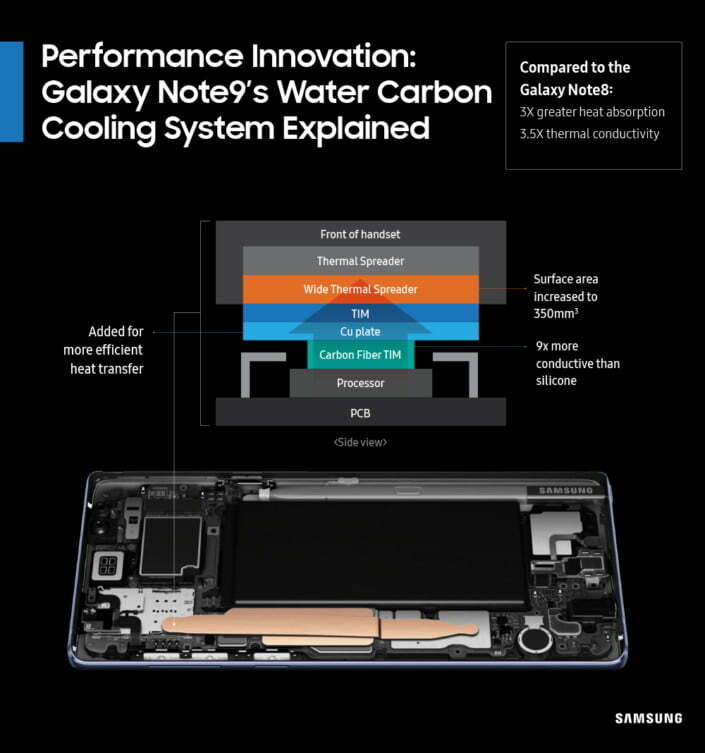 Check out the graphic above for more information about the Galaxy Note 9’s water carbon cooling system. The brightness and contrast were also worthy of note, increasing by 27 percent and 32 percent when compared to the Galaxy Note 8‘s display. 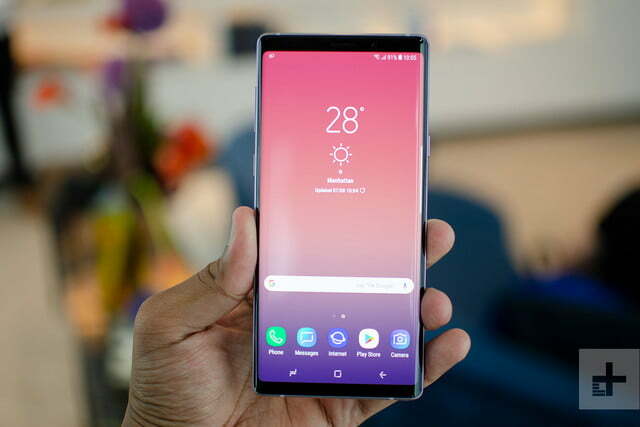 The Galaxy Note 9 is only the second smartphone to score Very Good to Excellent ratings on all of DisplayMate’s tests — the first being the Galaxy S9. Like with the Galaxy S9 and S9 Plus before it, Samsung has taken a more relaxed approach to physical upgrades this year. But that doesn’t mean that there aren’t some design differences between the Note 8 and this year’s Note 9. The Note 9’s bezels have been slightly slimmed down, but the two phones are almost the same size — the Note 9 is a little wider and thicker, but not as tall than the Note 8. The skimpier bezels allow for a larger screen, raising it from 6.3 inches on the Note 8 to a 6.4-inch display. It’s a Super AMOLED panel running a 2960 x 1440 resolution, in an 18.5:9 aspect ratio. Like all AMOLED screens, it shows off incredibly deep blacks and bright, vivid colors. The Galaxy S9 was awarded the highest score ever in DisplayMate’s testing, and as we expected, the Galaxy Note 9 has managed to exceed that, scoring a new highest score on DisplayMate’s tests. 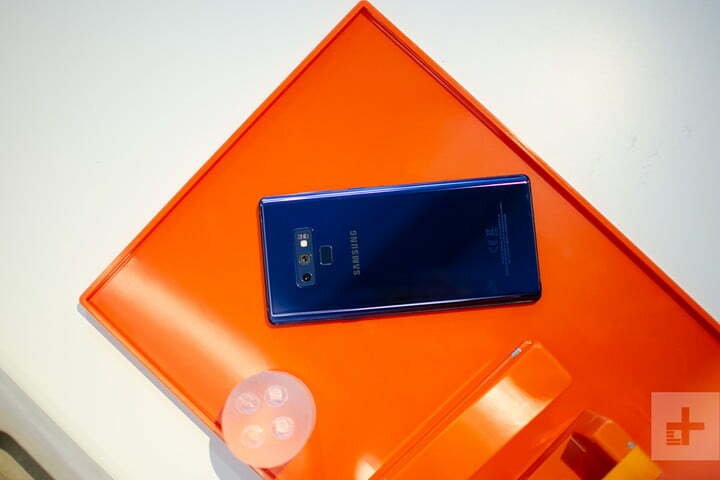 The Note 9 is made of glass laid over a metal frame, with Samsung’s signature curves that blend effortlessly into the curved Infinity Display that dominates the phone’s front. It’s just as fragile as ever, which means you’ll probably want a good case. Water resistance makes a return, with an IP68-rating that should see the Note 9 survive accidental drops into the pool. The much-maligned position of the Note 8’s fingerprint scanner has been moved to a more sensible position below the dual-camera lens on the back, and the similarly criticized Bixby key still sits on the left-hand side of the phone, below the volume rocker. 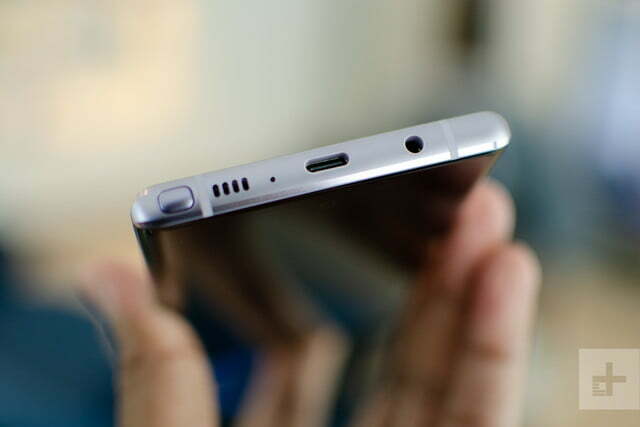 The power key is on the right, while the USB Type-C port and headphone jack take up their usual places on the bottom of the phone, next to a bottom firing speaker. This speaker works in tandem with the earpiece at the top, providing stereo sound. The sound system has also been tuned by AKG — Samsung’s usual audio partner — and it also comes with Dolby Atmos support. While the Note 9 may not have received much of a facelift, its insides have some fairly serious changes. The biggest improvement is the addition of the Snapdragon 845 processor that we’ve seen powering almost all of the flagship smartphones in 2018 — including the Galaxy S9 and S9 Plus. At the same time, you’re going to see slightly improved performance on the Note 9 over other phones using this processor because of Samsung’s new water carbon cooling system. According to Samsung, it should be three times better at heat dissipation than the Note 8 — meaning the processor can deliver stronger performance for a longer period of time. This is handy when playing games, or running any kind of intensive programs. There are two models of the Note 9 up for sale this year. The first model apes the Note 8, with 6GB of RAM and 128GB of onboard storage, but it’s the second model that will really catch your eye. It comes equipped with 8GB of RAM and a whopping 512GB of onboard storage. If 512 or 128GB isn’t enough for you, Samsung said it’s releasing its 512GB MicroSD card later this year which will support the Note 9, meaning you can potentially walk around with a terabyte of data in your pocket. Powering all these high-end specs is a massive 4,000mAh battery that should be able to keep the Note 9 going for longer. Samsung’s Adaptive fast-charging is back, and so is wireless charging. Samsung’s new Wireless Charging Duo pad will also let you charge your Note 9 and any other wireless charging capable device at the same time. 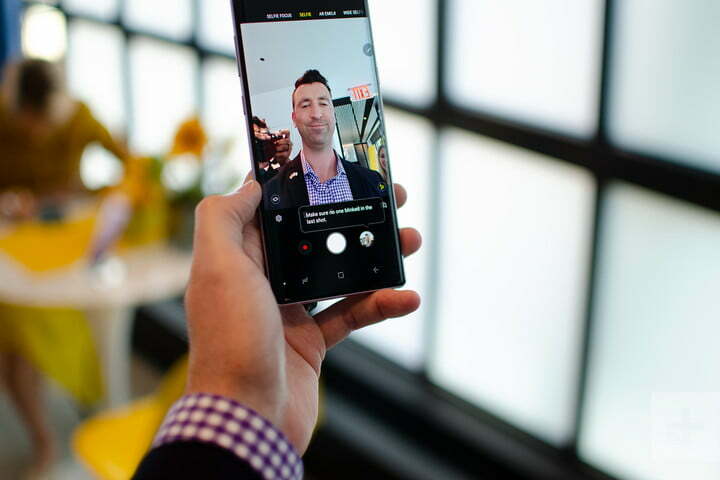 The core of the camera tech in the Note 9 remains the same as the Galaxy S9 Plus, with two 12-megapixel lenses on the back, and an 8-megapixel lens on the front. Embedded in the primary lens is the same variable aperture technology from the S9 and S9 Plus. Essentially, the camera can switch between f/1.5 and f/2.4 apertures based on lighting — the f/1.5 aperture will help provide better low-light photos. The second lens adds the same 2x optical zoom, and you’ll naturally be able to take bokeh-style photographs with Samsung’s Live Focus mode. Want more? Samsung is embracing the artificial intelligence (A.I.) revolution as the camera app now comes baked with A.I. assistance. With scene detection, the camera can identify up to 20 different scenes, and the A.I. will tune the exposure, color, and contrast to deliver a better photo. Samsung fed the A.I. hundreds of photos until it understood what a sunset or a mountain was, for example, and now it will know what changes to make for your photo to look exemplary. You can turn this off if the results are not to your liking. There’s also Flaw Detection, which pops up if the camera detects the lens has a smudge, if there’s poor backlight in the photo, or if someone blinked. The signature of the Note range has always been the S Pen, and Samsung has really thrown hard into that little stylus this year. Taking memos on the Note 9’s sleeping screen is back, and it’s got a new twist this year. 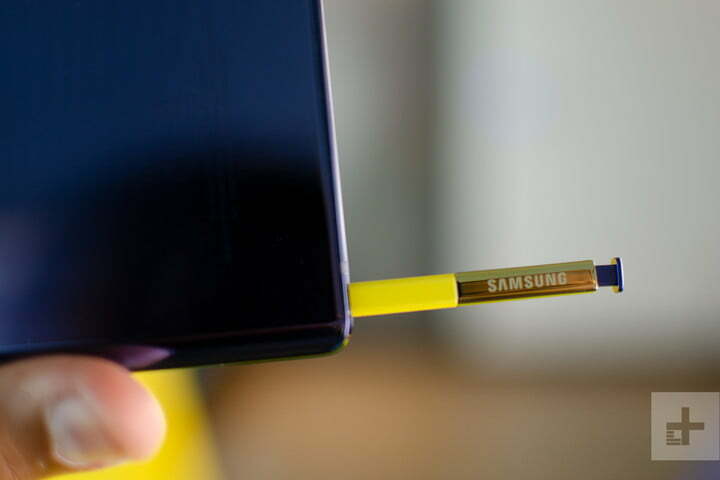 The color of the writing on the screen is determined by the color of your S Pen — yellow for the Ocean Blue Note 9’s yellow S Pen, and purple for the Lavender Purple model’s purple stylus. But that’s not all. It now comes with Bluetooth Low Energy packed in, enabling new functionality up to 30 feet away from the phone through the button on the shaft. You can control a powerpoint presentation with just the S Pen, or open the camera, switch to the selfie lens, and snap a picture — all without needing to touch the Note 9. You can choose your preferences in the Settings menu, and Samsung said a software development kit will be available so developers can create their own controls. This does mean that the S Pen now needs charging, but thankfully the skilled engineers at Samsung have managed to equip the stylus with a supercapacitor, so putting the S Pen into your Note 9 for just 40 seconds provides 30 minutes of charge. You probably don’t need to worry much about the battery.